Whether it is for protecting property and assets or ensuring the safety of your people and clientele – a video surveillance system keeps you wired-in to what’s going on at your business or facility. Advances in wireless technology are making it easier for businesses to install reliable and robust video surveillance systems without the cost and headaches of hard-wiring your premises or installing expensive monitoring consoles. Previously, analog cameras transmitted images over dedicated point-to-point cabling. Videos could only be viewed from a control console. However, today’s digital IP video cameras send video in real-time over your IP network (such as LAN or internet) and be watched on a variety of devices. 1. Easy installation: Without the need for point-to-point wiring, digital video cameras can be placed just about anywhere within your premises or on your property. Before, it was a chore to tie-in certain locations. Not anymore. Cameras can also utilize local power to avoid additional cables being required to provide where power isn’t able to reach currently. 2. An economical surveillance solution: Not only do you save money by eliminating infrastructure costs around wiring, today’s wireless systems no longer require dedicated or proprietary monitoring equipment. Videos can simply be viewed and accessed on a standard desktop system, laptop or even a mobile device. With any video system, storing and archiving footage can require high-volume storage capacity. This means you will need adequate space on your server or a robust subscription-based storage plan. Costs will vary based on number of cameras, amount of video stored and how long you wish to archive footage. 3. Exceptional image quality: Today’s digital camera hardware provides incredibly high resolution images, allowing you to zoom in to see what is going on in great detail – day or night. 4. Remote monitoring capability: All video images can be safely stored on a remote server or cloud-based storage solution. Which means, you don’t have to be at an onsite video console to access your cameras and review tapes. Authorized users can view high-quality images from anywhere via an IP network or internet connection. If you need to share images (with other team members, a security contractor, law enforcement agencies, insurance companies or even the HR department) it is easy to arrange. 5. Alerts and intelligence distribution: If anything suspicious occurs, key people (such as security personnel) can be notified right away. 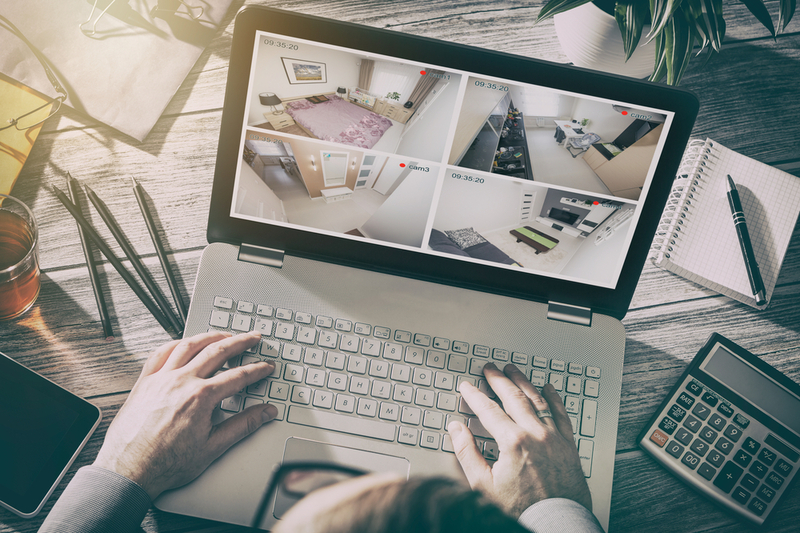 Many network surveillance systems are built with video-motion detection and alarm management features that are programmed to send alerts to authorized users. You can determine when to transmit the video, the frame rate and resolution. 6. Scalability and flexibility: It is incredibly easy to add new cameras to the network. A new IP video network can be seamlessly integrated with any existing devices or installations. At any time you can upgrade your system to include products that expand your capabilities (such as thermal or HDTV cameras). 7. Data feedback: Today’s network video surveillance systems use “smart” technology to provide you with valuable information and analytics that can benefit your business. From counting the number of people in a common area to providing real-time figures on how many customers are in line at a retail environment. In a busy area, the system can be programmed to make an auto-page announcement (eg. telling transit riders to move to the end of the platform). Video systems can also trigger alerts in the event of a workplace “fail” or emergency to ensure quicker response. As you can see, commercial video surveillance systems have come a long way. With the increased ease of installation, affordability and functionality, more and more businesses are taking advantage of the added security and safety video monitoring provides. While the need for an installer to run cables has been largely eliminated, it is still important to work with a professional communication company when implementing an IP video system. They will help you choose the features and functionality that will best serve your needs, and ensure that your system is properly set up and integrated with your IT network and data storage solutions.